Summary: Continuous Members are exactly like “Normal” members except they automatically connect to any nodes that intersect the member. 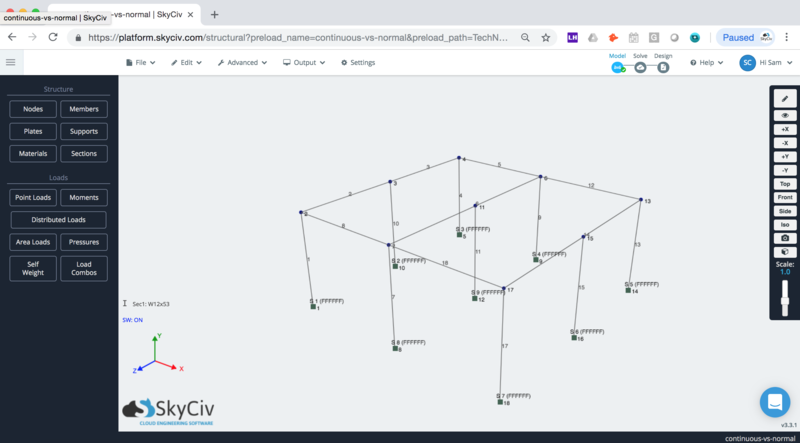 Today’s SkyCiv TechNote will explore an in-depth look at how members (or elements) connect to each other via nodes and how this is handled in the SkyCiv Solver. Nodes mark a point of connectivity between members, they are the separation of the stiffness matrices. Members can be a number of different types. In fact, Structural 3D actually has a current total of 6 member types. At the moment, we will look into the two types of members as these are fundamental member types for modelling in general. 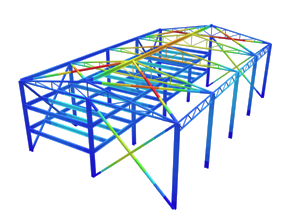 There are two main member types in Structural 3D: normal and continuous members. This discussion will be more in-depth with how they are both handled by the SkyCiv solver, as well as the advantages of using one from the other. Normal members are elements that are treated ‘normally’ in the sense that the members are analysed in the traditional sense. 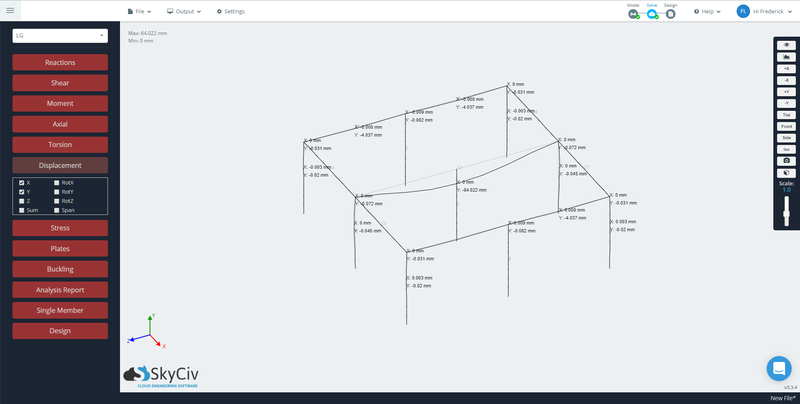 Structural 3D applies these formulas to the model and obtains the results from every node and member. Continuous members in Structural 3D are a type of member that automatically allows for connectivity between two nodes to nodes that have no nodal connection to the member. Node connections occur when a node is assigned to connect two or more nodes. In this case, the nodes are clearly not connected as the two members do not share a common node, but they should be connected because the node of the second member is along the path of the first member. In order to ‘connect’ these members, Structural 3D actually breaks the members such that these connecting members become normal members, such that program can apply the direct stiffness method to the member. This is done behind the user with the results in that analysis retrieved and presented to the model of the user. Models built with normal members are more likely to be compatible with third party structural analysis software. As other programs may not support continuous members in the way that Structural 3D implements it, the results provided may not be correct. It is important to check that there are no continuous members in the model before exporting it. On the analysis aspect, as the member is broken into simple members, the number of evaluation points in the model is more as opposed to continuous members which carry the same number of evaluation points across two or more spans, making the results less detailed. One can increase the number of evaluation points in the General Solver Settings, but as this controls the evaluation points for all members, the analysis could be longer. This can be a disadvantage when working with large and complex structures. Continuous members, on the other hand, are very useful when it comes to increasing the efficiency in modelling. Continuous members reduce the number of members required to make a similar model with normal members. This also has a direct effect with applying members where applying the same load multiple times across a span would be redundant. With respect to analysis, reducing the amount of members reduces the clutter when it comes to presenting results. 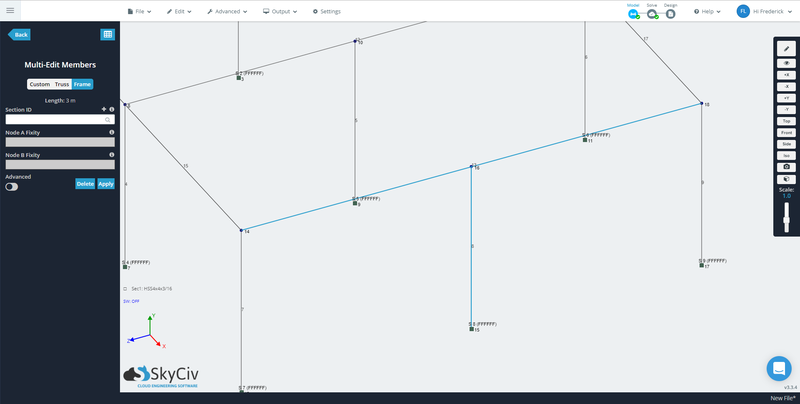 It also provides a better picture, allowing you to see the behavior across the span as opposed to selecting each part of the span individually. When it comes to design, continuous members shine for reinforced concrete beams as they are intended to behave monolithically. As a span does not usually change its cross-section in-between, it is also useful in identifying the required steel section for a particular span. Other interesting uses for continuous members include floor and roof framing.